Meanwhile, we would like to introduce FANG, our human's past kitty who at one time was the love of her life. We hate to think she had another love except US, but that's hwe have to accept these things. A long time ago, our human lived in NYC in the Village & that's where Fang lived too. FANG's Dad was pure Siamese, his mom a tabby. He had a large family: Chang, Ching, Sin, Ming, Ling, Cling. Fang was VERY clever! His favorite "hiding trick" was to curl up on a plate in the kitchen cupboard and close the cupboard door after him! We opened the cupboard door to set the table for dinner and...aaaaargh! PS: Fang sometimes looked very fierce if our human paid attention to her other cats when she got home. He was very loving bu very intense! We are joining Athena & Marie's Cat-urday Art Hop today. 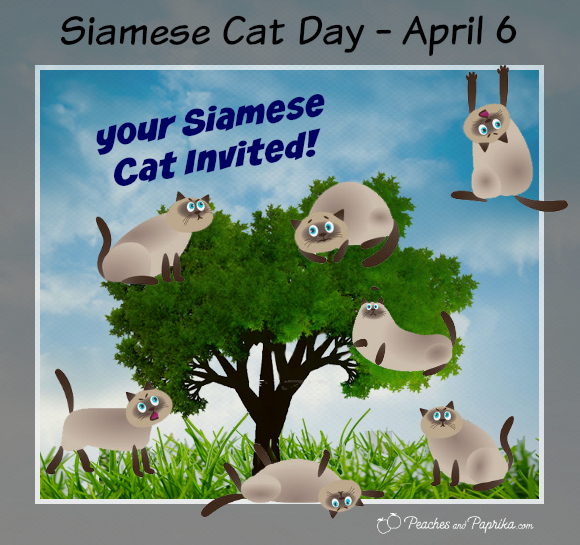 Happy National Siamese Cat Day to all. I just love those pics! I love Siamese, never been privileged enough to live with one, but you never know what the future will bring! I love meezers! If I weren't so tortie obsessed they would be my favorite kitties. Fang was a cutie. 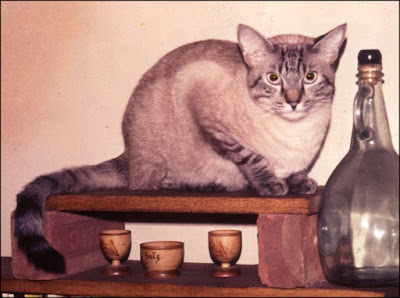 I would like a meezer someday, but cats keep showing up when I have an opening so I keep them instead of going to a shelter to find one. Fang was very pretty. Thanks for introducing us to her.